Tuesday was rather distressing. The details aren’t important, and everything is fine and dandy now, but Tuesday? Yikes. I couldn’t eat, I was so upset. Not even my stockpile of Mint M&Ms were appealing. I went to a movie, at 9:30 on a Tuesday night. It was lovely–both being out late and the movie. ← Previous Post Stay, Diego, Stay! wow – i know what you mean. glad you found releif – movies and gyms work wonders. i try to go to the gym every morning – like taking vitamins – preventive medicine. Yikes, it wasn’t our session was it? You seemed fine then! You sure worked hard but generally crunches don’t cause psychic distress 😉I’m sorry you had a rough day but proud of you for following through with your fitness plans for the day.I would love to see that movie, so glad it was a pick me up for you. 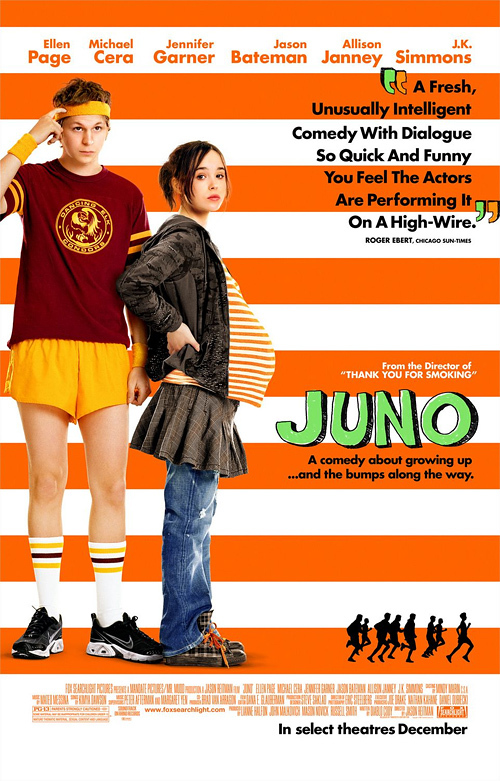 Juno is such a great movie. Glad you loved it. Sarah–I’m putting a lot of trust in the preventive medicine of the gym these days.Kirsty–it wasn’t our session. Although the crunches did cause psychic distress.Sherpa–I was so happy that I liked Juno so much. Sometimes when a movie is hyped, I don’t enjoy it as much as people say I will (Enchanted, for example).